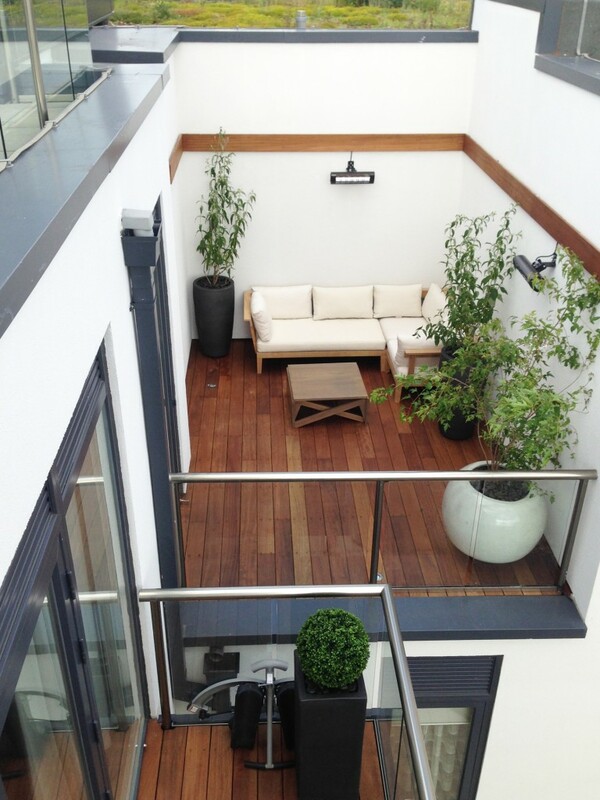 This small contemporary, roof terrace, garden design in Clerkenwell EC1 creates a light fresh relaxing environment. The light coloured silicone rendered walls bringing light and greater sense of perceived space.The Iroko hardwood decking giving a warmth and relaxed tone to the space. Small spaces need careful space planning and use of good quality materials.This Clerkenwell garden design as with most inner city London garden spaces are quite small and need careful design with attention to detail. We wanted this small garden roof terrace in London to have the capacity for dining and well as casual lounging and entertaining. The problem was lack of space . We introduced the idea of a convertible coffee table that extends to a dining table . We created a large inbuilt cupboard to the left of the space which houses the cushions and fold up chairs and minibar fridge ( very important !). 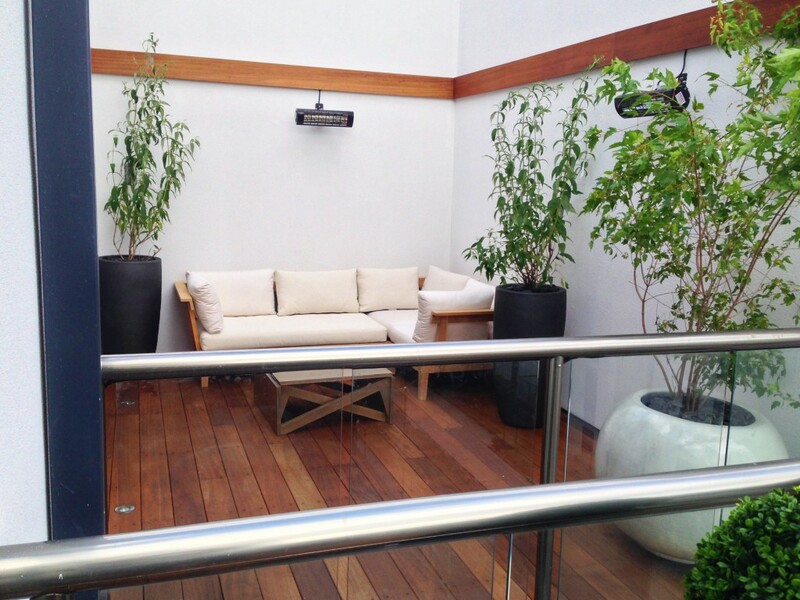 This allowed us to convert this roof terrace outdoor room into a dining area thats seats 6 people. After dinner simply pack away , fold down table and party into the night!! 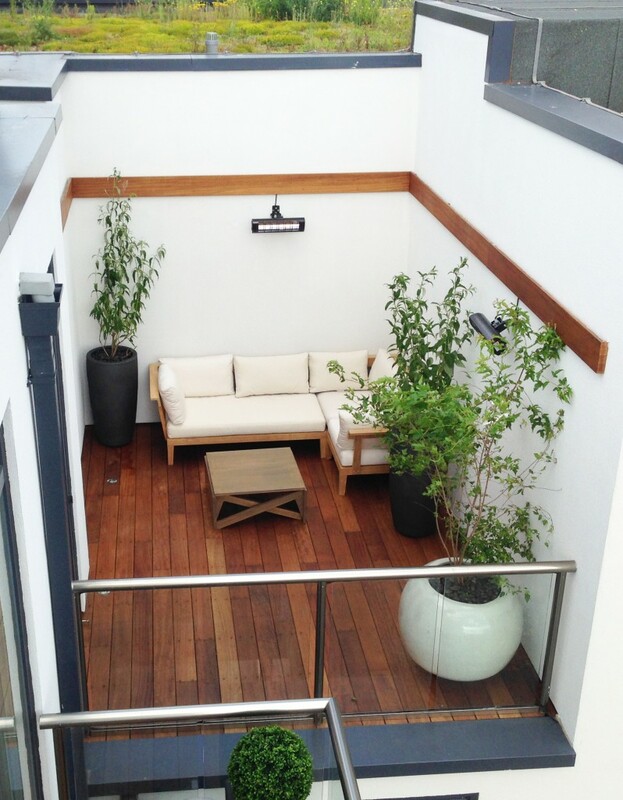 The hardwood timber present in designer outside furniture, coffee table , hardwood decking and hardwood lighting strip unify the space bringing warm tones and natural elements . We introduced a lighting strip with timber pelmet to add that extra dynamic and sparkle to the space. The strip breaks the wall mass down and highlights the contemporary nature with reinforcing the clean lines. The upper bedroom windows looked out onto the the apartment block roof so we softened the space, creating interest and colour with the installation of a sedum roof. This roof terrace design and build in Clarkenwell Shoreditch utilises economy of space and multi functional use . Please feel free to browse or portfolio showing a selection of styles and concepts , or go to our services section on London roof terraces . Contact The London Landscaping Company today for more information or to arrange a consultation.